Every time I do up a big ham, I always save the bone. Usually, I make split pea soup with it, but this time, I decided to try something new, slightly. I decided to do a black-eyed-pea soup. This recipe is a variant from something I found online at recipezaar.com. One of the big changes I made was the orange juice. This ham soup recipe originally called for Sherry. I looked up some alcohol substitution charts online, and they all suggested orange juice for sherry. Having never tasted sherry, I don't know if that's a fair replacement. Still, it tasted good! Other than soaking the beans, there's really not much to this dish. So, this one is also really good as a beginner dish, since it's really just a dump it in and cook it kinda meal. Like I said before, there's really not much to this ham recipe. The night before, I opened up the package of beans and put them in a bowl with lots of water. You need to do lots because the whole point is to have the beans soak it up. So, put in an inch plus or so of water higher than the beans. The next day, drain the beans, and drop them into a dutch oven. Pour in the liquids, and drop in everything else. Because there's a lot of water, I used a lot of salt. It was very very yummy, especially with the french bread! I'm sure it has some connection to my deep-seated need for validation and praise, and probably stems from something my parents did wrong when I was very young. Trust me. It's their fault I need therapy. But once in a while, I like to cook something just for me! Like Kofta bi Tahini. I don't care if the rest of the family doesn't like it. I do, and I'm gonna cook it and eat it all myself! See, one thing my dad did (right) for me is show me how incredibly good a sandwich you can make with three basic ingredients: Rye bread, braunschweiger, and baby swiss cheese. I love those sandwiches. But my wife hates them. She even hates me after I eat them. Well, specifically, she hates my breath after I eat them, but then, when it comes to emotional traumas, let's not split hairs, here, shall we? But today I baked dark rye bread, so that all this week, I can have various sandwiches at work, one of which will be, of course, the dreaded 'schwiegermeister. Oh, yes. It will be yummy. It will make my lunch time worth living for. 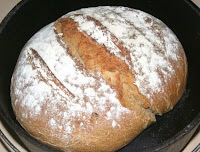 Dutch Oven Sourdough Rye Bread. So, I started out last night by activating the start. I poured out what I had left into a bowl and added about a cup of water (just sorta hot to the touch), and a cup of flour. That was pretty early in the evening. By later that night, it was starting to foam up. I'd just like to say that, as a point of pride (another big psychological issue of mine) that this sourdough start is wild-caught sourdough yeast, not using commercial yeast. See, if you just use yeast from a jar, then what you're really doing is cultivating a culture of commercial yeast. The fact that you leave it out overnight doesn't really change the fact that it's still a commercial yeast. On the other hand, if you get a start from just leaving out flour and water, and you catch yeast from the air, then it's a truer sourdough, and I think it tastes better. I also need to comment on the "Dough Enhancer". This is an interesting ingredient that my friend over at Mormon Foodie turned me on to. It's got a bunch of interesting things in it that make dough rise up better and have better structure. I'm not entirely convinced it's absolutely necessary, but I've been experimenting with it lately, and I'm not unimpressed. The added Vital Wheat Gluten flour was added because I've read that rye flour doesn't have the gluten content that wheat flour does. I found it made a big difference today, compared to the last time I made rye bread. I set that aside, and let it ferment overnight. Not just overnight, but much of today as well, since we were out and about as a family. When I came back, it had fermented up nicely. I added all of the ingredients in the second set, except the flour. That, I added while I was kneading it. In retrospect, I'd probably mix about 3/4 of a cup in the bowl, and then add more on the table as needed, because it was really sticky on the table for quite some time. I kneaded for around 15 minutes or so, until it passed the "windowpane" test, then sprayed a bowl with oil and set it in to rise (also coated with spray oil and covered with plastic). It probably rose for an hour to an hour and a half. I find my raising times are much shorter now that I'm kneading the bread more thoroughly. In fact, if you'll allow me to digress for a moment, all of the breads (except the frybread) at the cookoff were underrisen, and as I was watching the competitors in the field judging, I wondered if they were kneading their bread enough. Then, I rolled it down and put it in the oiled dutch oven to proof. I scored it with three slashes across the top (even with that, it still tore apart in the cooking...). While it was proofing, I got the coals going. Once the coals were hot enough, I put the requisite amount on the lid to preheat it. That sat for probably about 10 minutes or so, and then I put the dutch oven with the sourdough bread dough on the coals, and closed on the lid. I've learned that I have a very difficult time telling when bread is done, and regulating the temperature. I just basically try to keep enough coals on it to be hot enough, a bit higher than a typical 350 degree bake. It's proabably around 375 or so. But a little past half way through, I stick a meat thermometer in it and close the lid. I bake it until it reads about 190, because I like it a little softer, with not such a hard crust. Then it was done. I let it cool, cut it and made a sandwich. Hmmmmmm! So, on Saturday, I had a very interesting experience. I was asked to be a field judge for the Eagle Mountain Pony Express Days Dutch Oven Cookoff. I wasn't quite sure what to expect. 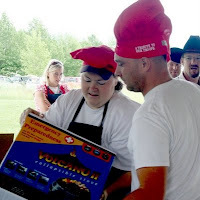 I'd participated in the cookoff the previous two years, and had interacted with field judges each time. Still, interacting doesn't mean the same as doing. I read over the instructions and the judging criteria the night before. They had all turned in their recipes. Part of what I was supposed to do was to make sure that they cooked their chosen recipes in a safe and correct way. Actually, that's not entirely true. My job was to watch them do it and mark them down if they did it "wrong". It seemed that all of the criteria in the scoring was based on messing up. I thought that was strange. They got 3 points in each of five categories. The highest score was defined as "satisfactory", and the others were things like "Needs Minor Improvement", "Needs Major Improvement", and "Don't Eat Their Food". There were no provisions for someone doing something exceptionally well. That would have made my job much easier. See, the teams all knew what they were doing, and did a pretty good job of it. So, with a few minor exceptions, they all did "Satisfactory". So, how am I to distinguish? But it was a lot of fun. I got to know some good dutch oveners, and it was fun. 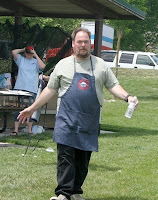 Here I am, yours truly, walking out to the judges table from the cooking area. Like I have said before, it's not often that I get a picture here in the Black Pot, and that's probably a good thing! In addition to a fun new experience, I also got to keep the cool embroidered apron! These guys were new to competition, so it wasn't a surprise that they didn't place as high, even though their dishes were well done. When you've competed a while, you learn certain touches in presentation and style that really impress judges. I really liked their bread, and I want to try their spicy chicken, too! The judges table! The judges were an interesting mix. About half were local celebs, and one was the author of a food storage cookbook, and there were two that actually had some cooking skills. The judging was difficult, too. 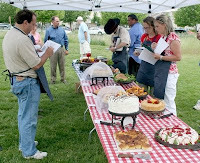 I was allowed to taste everything, but as a field judge, I didn't vote in the taste testing. In all but a very few cases, it was tough to pick a favorite! This one's the winner's main dish. It was wonderful! Ribs with a homemade BBQ sauce. I thought the shrimp on the edge was a nice touch, too. This one was incredible, and I want to make it at home sometime. 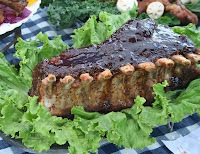 A pork rib roast with a brown sugar and pepper sauce. Man, it was gooooooood. The winners! Not only did they win the prize, qualifying for the World Championship Cook Off next spring, but they also won the Mayor's Choice award (second year running!). This couple also competed for the first time with me the first time I did the Eagle Mountain.